Today I had small possibility to make a recording. Before I had always used "SharpCap" as my recording software but today I used for the first time "FireCapture". I like this software a lot but with these new layout I forgot to make a "flat frame" and in the meantime it was back cloudy. This is the quick capture from today 2019-03-24. 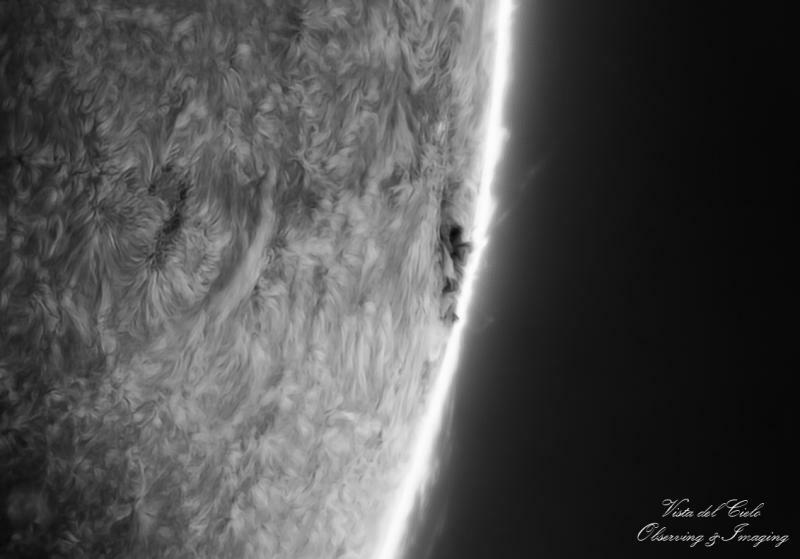 ASI 174MM - Quark Chromosphere - 0,5x reducer - 150mm refractor with D ERF. Edited by MAURITS, 24 March 2019 - 06:54 AM. Loc: Queens, New Yawk, Light pollution Headquarters! Love the processing! You've managed to capture great detail while retaining that wonderful soft look of the churning plasma! Thanks James and Warren for the nice comments. Thanks for posting. I’m really enjoying your images. I now have in the meantime also the Quark Prominence filter. For the Quark Chromosphere I need the "minimum bandwith" for the best surface details. I don't know if this is the same conclusion for the "Quark Prominence" to see the prominences on the edge of the sun ...? Edited by MAURITS, 26 March 2019 - 10:12 AM. That is outstanding, nicely done! If you run your Chromosphere model at a faster focal ratio, like F15~F20, you'll get the same effect (wider bandpass) as the Prominence Quark model. Really? All I have to do is swap out the 4x for the 2x? I gotta check that one out. The Quark's etalon's bandpass is sensitive to the focal-ratio of the telecentric beam going into it. Bandpass narrows as the focal-ratio gets longer, so F30 is a good starting point, but F40 is better, if you want narrow bandpass and high contrast. If you shorten the focal-ratio, so that less than a F30 beam is going through that etalon, bandpass widens significantly, the image is brighter, but you lose contrast on the surface significantly, but the wider bandpass that is brighter allows prominences to be brighter. Prominence Quarks are not special, they're really the "worse" quality etalon out of the batch that couldn't be sold as Chromosphere etalon models or better. You can simply drop down to F15~F20 and basically have a Prominence Quark. The bandpass will be a lot closer to 1A rather than 0.6~0.4A in a good copy of a Chromosphere model with an F30~F40+ beam. This is insane, such an ethereal image. Absolutely love it.